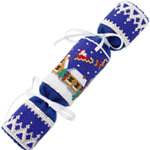 In 2007 ThreadABead.com was launched, and on the site one of the very first patterns added was The Beaded Christmas Cracker (http://www.threadabead.com/92/1/The-Beaded-Christmas-Cracker-Bead-Pattern). To this day, this pattern remains popular and so to celebrate 10 years of bead design we have asked Lynsey to revisit this pattern and create a new look on an old favourite. This new design wraps around the panel and features a snowy Christmas village, including Santa in his sleigh of course, on a starry night sky with silver and white decorative accents. As usual with ThreadABead featured patterns we give full detailed photographic instructions and in this pattern there are 27 detailed steps, making this pattern even suitable for beginners to beading. This bead pattern is made using Japanese Miyuki size 11 Delica. Odd Count Peyote stitch is used but full detailed instructions are given and no previous knowledge of the stitch is required. Please note the pattern may not work with any other size and type of beads. There are 12 delica colours in total and the finished beadwork is approximately 8.5 cm x 15.5 cm. A piece of dark blue felt 8.5cm x 15.5 cm, matching string cotton thread and around 20cm of white ribbon or string is also required. The bead pattern supplied is 12 pages and includes 27 full colour photo instructions.